I have always been amazed by the stories I continually hear about people becoming lost in the woods. When you are in an area of thick forest, it only takes a matter of minutes for you to become disoriented. 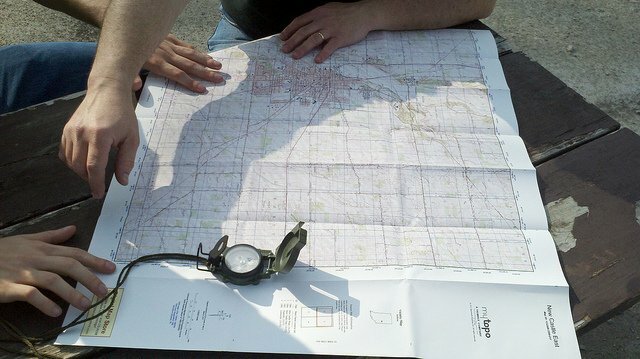 Sometimes there is no place to get a good vantage, which is why a compass is always a good item to have in your bag. But in the rare case you don’t have one, there are some tips to finding north without a compass. One method is called the shadow tip. Recently, I read of an experienced guide becoming lost in the Boundary Waters Canoe Area Wilderness in Minnesota. The word “experienced” really falls out of play when you fail to adhere to a few simple survival codes, one being preparedness. Considering the enormous size of the Boundary Waters, and it’s maze of lakes and bogs, it is not difficult to imagine getting disoriented there. But one mistake that seems to always pop up is assumption. Many people, including myself, assume that they know the area “like the back of their hand” and traipse off without bringing essential gear. In Lake Tahoe, where I grew up, I knew the area so well that I often joked about being able to find my way home with my eyes closed. I got seriously lost a couple of times in my own back yard. I didn’t seem to learn after the first time. The other thing that baffles me is how many stories I hear of people, who become lost, wandering around for hours and finding themselves back where they started. This has happened to me as well and it still perplexes me. Researchers in Germany recently studied the phenomenon, reports Discovery News. The guide in Minnesota truly believed that he needed to travel south to find the trail he had lost, and he was correct. He had no compass and he made a general assumption that he was traveling south. He did one thing right to ensure he was going in a straight line. He repeatedly took bearings and followed his course. In other words, he picked a spot in the distance and kept it in sight until he reached it and then did it over and over. This enabled him to go in a somewhat straight line. Unfortunately, he would have come out alright if he was indeed traveling in the right direction. His assumption, which was only slightly off, added up after hours of travel. Once again, the first mistake was to forget his compass and the second was to assume he knew where south was. Had he been traveling true south, he would have been rescued himself. Instead, he spent a week, cold, scared and lost with no overnight gear. There’s an easy way to determine your direction if you forgot your compass. This method can even be used in the moonlight. It’s called the Shadow-Tip Method and it’s one of the easiest I have found. Find a stick about three feet long, a sunny area (it works in overcast too, as long as a shadow is cast) and plant it in the ground. Place a marker (a stone or a twig) at the end of the shadow. Now wait 15 or 20 minutes (longer for more accuracy). The shadow has now moved. Mark the new location. Draw a line between the two points and presto! You have located east and west. North and south are easily located by placing a stick perpendicular to the one you’ve laid down. Amazingly, it was darn accurate when I checked it with my compass. The bottom line is to always have a compass but if you don’t, this method can set you on the right course and maybe even save your life.